Oaxaca is a worthwhile destination any time of the year, but Day of the Dead is a particularly magical time in this city. Located in southern Mexico, Oaxaca is steeped in rich traditions and Día de Muertos is one of the biggest celebrations of the year. Oaxacan Day of the Dead celebrations take place over several days. The main events take place from October 31st to November 2nd, but there are related activities that take place before and after these dates. Different villages have different customs around the celebration, and may observe Day of the Dead on different dates. Read on for more information about Day of the Dead celebrations in Oaxaca, and some travel tips for visiting Oaxaca during this special time. Many of the Day of the Dead altars you'll see in Oaxaca are works of art. Schools and social organizations hold contests for the best altars and some of them are astonishingly intricate and beautiful. You may see paths of cempasuchil petals leading up to altars. These are believed to help the dead to find their way. Find out how to make your own Day of the Dead altar, and see more photos of Day of the Dead altars. Since Día de Muertos is such an important celebration for the people of Oaxaca, nearly everyone goes to the market to buy the things they need to make their altar and the special foods that are prepared at this time of year, like chocolate, tamales, and black mole sauce. For a visitor to Oaxaca during Day of the Dead, a trip to a market is essential to see all the items that go into a Day of the Dead altar. You can visit the 20 de Noviembre market in town, or pay a visit to the Central de Abastos market south of the city center (just beware of the crowds, and don't get lost - it's a huge market). A trip out to one of the villages to visit market day around the time of Day of the Dead is always a special experience. The Friday market in Ocotlan is a good choice. There are several different types of bread in Oaxaca that are known as pan de muerto. The one that you see most often is what is known the rest of the year as pan de yema, "yolk bread," with decorative heads stuck into it. This bread is delicious, especially when you dunk it in the local Oaxacan hot chocolate! Sand tapestries, known as tapetes de arena in Spanish, are common in Day of the Dead celebrations, but they're also part of Oaxacan mortuary customs. When a person dies, after the burial, a sand tapestry is made in their home. The tapestry depicts a religious image such as a saint that the person who died had a devotion for. For nine nights family members and friends gather to pray in the family home. On the ninth day, the tapestry is swept up and the sand is taken to the cemetery. The sand from the tapestry is poured onto the grave as part of a special ceremony. For Day of the Dead sand tapestries are also made, but these are usually whimsical images depicting skeletons and other themes related to death and Day of the Dead. While wandering around Oaxaca during Day of the Dead, you're sure to find many of these on the street, and in certain shops and public buildings. Every year there is an altar and giant sand tapestry set up in Oaxaca's Palacio de Gobierno (now the Museo del Palacio). There is also usually a contest for the best altar - with altars set up around the main floor of the building. A visit here is a must during Day of the Dead in Oaxaca. Other places to visit in Oaxaca city to see Day of the Dead altars, sand tapestries and other decorations include the Escuela de Bellas Artes, across from La Soledad church, and the Casa de la Cultura, as well as along Alcalá Street (the pedestrian walkway) and in the Zocalo. 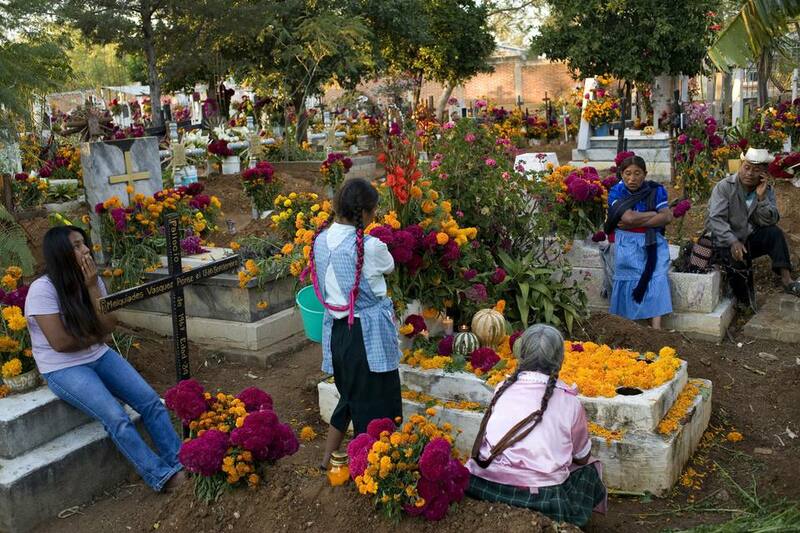 A highlight of Day of the Dead in Oaxaca is a visit to the cemeteries. One of the main cemeteries to visit is the Panteon General (the Oaxaca General Cemetery), also known as the Panteon San Miguel. Here you will find candles lighting up the niches, and some Day of the Dead altars. There are stands selling treats and carnival rides set up outside the cemetery. The village of Xoxocotlan, commonly called Xoxo (pronounced "ho-ho"), which is now encompassed by the urban sprawl of Oaxaca city, is a good place to visit on the night of October 31st. There are two cememteries, here, the Panteon Viejo (old cemetery) and the Panteon Nuevo (new cemetery). Many people visit this village for Día de Muertos, both tourists and locals, and some people claim it's becoming too touristy. I still think it's a great spot to visit - although there is in some aspects a carnival atmosphere, you will still find quiet spaces where family members remember their loved ones. There are many photo opportunities here, but try to be discreet, and ask for permission to take photos. There are many other cemeteries to visit in the villages around Oaxaca. Different villages celebrate on different nights, and some cemeteries are only open during the day, but may still be worth a visit to see how the graves are decorated. Another Day of the Dead tradition in Oaxaca is the Comparsas. A comparsa is a carnival-like procession of people in costumes, with music and dancing. These take place in many different barrios (neighborhoods) of Oaxaca and also in villages. Often these are informally organized, so it's difficult to know when you'll see them. Some of the most popular comparsas take place in Etla, and many tour agencies in Oaxaca offer trips to Etla to see and participate in the comparsas there, on the night of November 1st. Día de Muertos is high season for Oaxaca - a lot of people want to experience this special occasion - so make your travel reservations well in advance. The weather in Oaxaca is generally mild throughout the year, but it may be chilly in the evenings, so be sure to pack a sweater or light jacket, and comfortable walking shoes for visiting the cemeteries (they have uneven terrain which is hard to see at night). Plan visits to the cemeteries, but also take some time to stroll around town in the evenings. You'll find there's lots going on! There may be many moments when you would like to take photos. For public displays in the streets there's usually no problem, but if you would like to photograph people in the cemeteries, it's better to ask first ("Puedo tomar una foto?"). You may be approached by children (in costume or not) with hand outstretched saying "Halloween!" Aware of the custom of trick-or-treating, they hope for a handout. If you don't want to give them anything just say "No, gracias," and keep on walking. If you would like to give them something, they'll be happy with a few pesos, or even better, carry some candy or other treat to hand out (though if you do this, don't be surprised if you suddenly become very popular). Enjoy Day of the Dead in Oaxaca! Read about other Day of the Dead destinations in Mexico. Other special celebrations in Oaxaca include the Noche de Rabanos (Radish Night) and the Guelaguetza.